Fish recipes can be made from fish that is fresh, frozen, canned or smoked. The taste of your final product may vary greatly depending on the type that you use. I consider fish to be grown in freshwater unlike seafood which is from saltwater. Some fish coming from freshwater are perch, whitefish, carp, walleye, pike, bluegill, some trout and crappie. Fresh fish can be identified by its bright bulging eyes, bright red gills and firm elastic flesh that holds no imprint when pressed. Its fresh characteristic fishy smell should have no trace of foreign odor. The scales should be close to the skin and have no slime. Fresh fish and shellfish should be placed in the refrigerator in their original wrapper immediately. Do not keep fresh fish in the refrigerator longer than a day or two before cooking. Frozen fish which have been cleaned and frozen as soon as caught can hardly be distinguished from fresh cleaned fish. Frozen fish is usually sold as fillets and is a good choice for fish recipes for people who live far from fishing sources. Frozen fish and shellfish should be placed in the freezer in their original moisture proof wrapper. Do not keep in the freezer longer than six months. Do not thaw fish at room temperature or in warm water. Place individual packages in the refrigerator to thaw. For quick thaw run cold water over package. Frozen fillets and steaks can be cooked without thawing. Fish and seafood have always been highly prized as delicious food by those who had access to fresh supplies. Refrigerator shipping facilities now make them available to everyone canned and smoked fish are generally eaten without further cooking. Fish are especially valuable for their vitamin and mineral content. 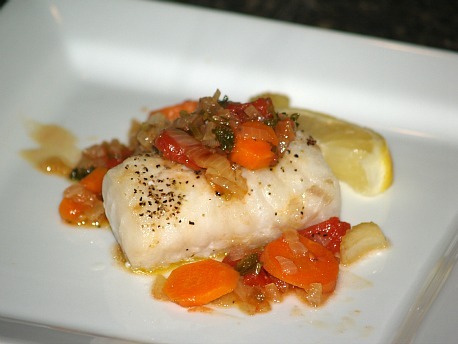 Make this simple fish recipe served with vegetables. Clean fish thoroughly; rub with salt and pepper. Add all remaining ingredients and simmer until vegetables are tender. Bake fish at 350F degrees in greased baking pan until done (approximately 30 minutes). 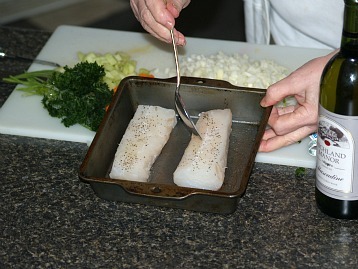 Remove fish from pan to warm platter; cover with vegetables and sauce and serve immediately. Make this tasty fish recipe with a raspberry mustard. Mix mayonnaise and mustard in small bowl. Place fish in shallow baking pan; cover fish completely with mayonnaise mixture. Bake for 10 to 15 minutes; just until fish is done. If top is not brown place under broiler for a few minutes. If you are a fisherman and end up with too much fish you can pack it in cans. Scale and clean the fish and pack solidly into hot sterilized pint canning jars. Add ½ teaspoon salt to each jar; place jar lids on jars. Place in pressure canner; process at 15 pounds of pressure for 90 minutes. NOTE: During the processing the fish bones will disintegrate leaving only the large backbone which can easily be removed. Make this fish recipe cooked on kabobs. Combine oil, juice, oregano, dill, bay leaf, salt and pepper in a shallow dish. Place fish in marinade making sure both sides of fish are coated. Cover dish and refrigerate for 2 hours basting occasionally. Remove fish from marinade (Save marinade). Place fish, onions and tomatoes on skewers alternating. Bring reserved marinade to a boil and serve with the kabobs; serves 4. NOTE: If using wooden skewers, by soaking them in water first will prevent them from burning during cooking. Preheat oven to 375F degrees; arrange sliced onion in 13X9 inch baking dish. Wash fish and pat dry; place fish over the onion. Sprinkle with salt and pepper; add tomatoes, olives, basil, parsley and garlic. Sprinkle with clam juice; bake uncovered for 20 minutes until fish flakes. 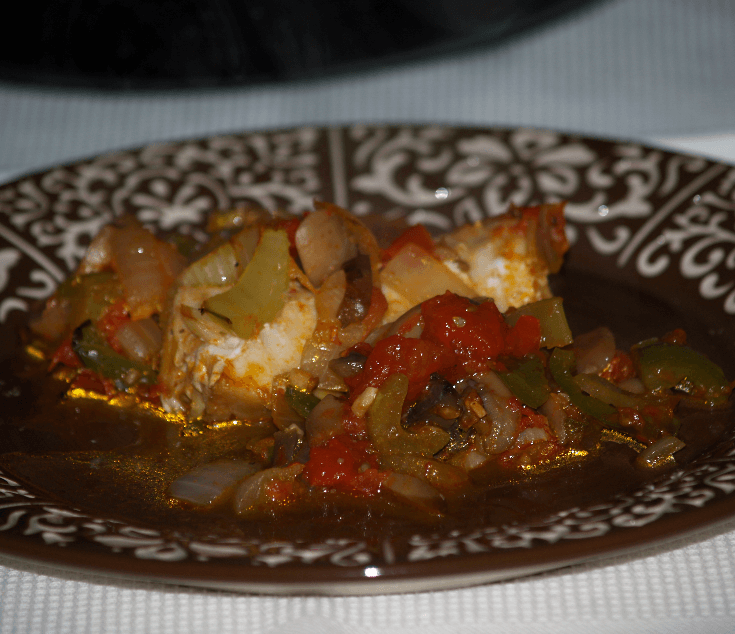 Make this fish recipe with a delicious tomato sauce. Coat a large skillet with cooking spray; place over medium high heat until hot. Add onion, green pepper and garlic; cook until vegetables are tender crisp stirring constantly. 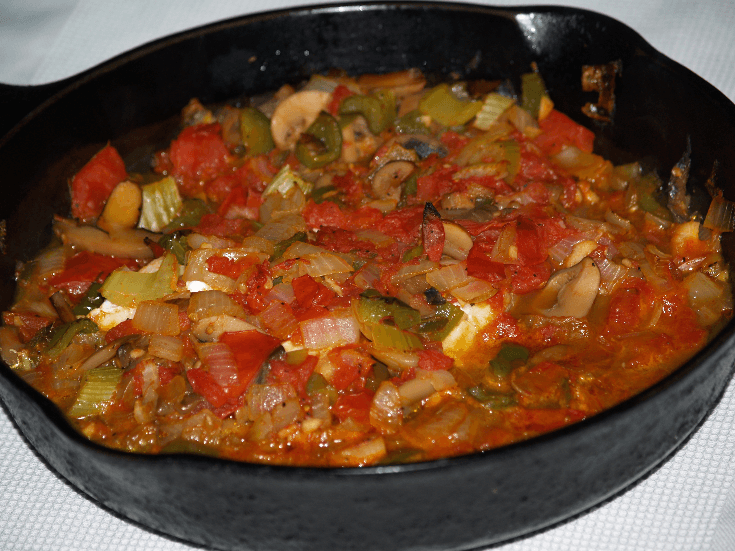 Add canned tomatoes, mushrooms, fresh tomatoes, celery, jalapeno and sugar; season with salt and pepper. Bring mixture to a boil, cover and reduce heat; simmer 15 minutes. Uncover and simmer 10 minutes longer. Place fillets in 13X9 inch baking dish coated with vegetable spray. NOTE: I saute the vegetables in my iron skillet and simply slide the fish under the veggies and bake. Pour tomato mixture over the fish; bake uncovered for 20 minutes until fish flakes. I love fish recipes made with curry seasoning! Place fish in a large heavy zip top freezer bag. Combine and mix peanut oil, lime juice and soy sauce. Pour sauce mixture over the fish; seal tightly and refrigerate 1 hour. Soak wooden skewers in water for 30 minutes; peel shrimp, devein and set aside. Remove fish from marinade and reserve marinade. Place marinade in saucepan and bring to a boil; set aside. Alternately thread fish, shrimp, cucumber and onions onto skewers. Coat food rack with cooking spray; place rack on grill over medium hot coals (350F-400F). Place skewers on rack, cover and grill 10 minutes until fish flakes easily and shrimp are pink. NOTE: Turn and baste occasionally with reserved marinade. Serve over rice with curry sauce and condiments; serves 6-7. Over medium high heat cook onion, apple and celery in butter in a large saucepan. Stir mixture constantly until tender; sprinkle with flour and curry powder. Add chicken broth, cream and lemon juice; cook and stir until thickened. Stir in salt, pepper and mango chutney; serve with kabobs and rice.